Dr. Kumar has received M.Tech degree in Solid State Materials from IIT Delhi and Ph.D degree in Engineering from IISc Bangalore. 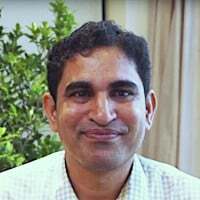 He worked at Central Research Laboratory of Bharat Electronics Ltd. (CRL-BEL) Bangalore as Scientist from 2005 to 2013. During his stint at CRL-BEL, he has worked on industry-academia collaboration that involved CRL-BEL and Materials Research Centre, IISc Bangalore. He was involved in the development of GaN based blue LEDs, Quantum-well infrared photodetectors, Solar cells and III-V quantum dots based detectors. He also worked at University of Paderborn, Germany as visiting scientist under Bilateral Exchange Programme of INSA. He has received INSA Medal for Young Scientists-2014,the MRSI Medal-2016 by Materials Research Society of India, Young Achiever Award-2016 by Department of Atomic Energy and ISSS Young Scientist Award 2017 by the Institute for Smart Structures and Systems. He has been awarded among top-10 outstanding reviewers for CrystEngComm (RSC) in 2016. He is founding Member and Chair of Indian National Young Academy of Sciences (2015-2019), Member of Global Young Academy (2017-2022) and IEEE Senior Member from 2016. He has been selected for the prestigious Bhaskara Advanced Solar Energy Fellowship supported by the Department of Science and Technology, Govt. of India, and the Indo-U.S. Science and Technology Forum. He has published more than 80 research articles. Sustainable Energy, Science, Education: working for a better future in India. What separates developing and developed countries? What does it take to close that gap and eliminate all progress borders? Doctor Mahesh Kumar explains the scientific and research steps to take to bring developing countries into the future. As Assistant Professor of Electrical Engineering at the Indian Institute of Technology Jodhpur, Doctor Kumar is developing new ways to bring sustainable energy to the farthest communities, working on building awareness as much as on the applications of better and friendlier consumption methods for India and the world. Doctor Kumar is also Chair of the Indian National Young Academy of Sciences, which works on building a network that interconnects fellow scientists with each other and with government authorities in order to bring attention to the scientific and educational potential growing in the country. Mahesh Kumar: I am Doctor Mahesh Kumar, Assistant Professor at Electrical Engineering at the Indian Institute of Technology Jodhpur. I am also Chair of the Indian National Young Academy of Sciences. Nerina: What is your research focused on? Mahesh: I am working on electronic material for energy-efficient devices, such as light-emitting diodes and sensors for environment monitoring. Nerina: Why this topic? What is its relevance? Mahesh: If we see in the future, energy will be the biggest problem, and we have a limited stock of our hydrocarbon fuels. So now we have to start to think on renewable energy sources, such as solar cell, hydro, and wind energy. Also, at the same time, we have to think on energy-efficient devices; we have to make some devices. By using this one, we can save the power. Not only the power production is important, but at the same time, power consumption also has the same importance. If we see the last 20 years’ data, worldwide we have increased the electricity production almost double. And if we see in the developing countries, for example in India, we have increased our electricity production by five times. But what about the consumption? At the same time, our requirements also increase. So today’s demand is that we have to make the devices that can save the power and can give the same output at a low power consumption. Mahesh: Right now, I am working on light-emitting diodes by using the gallium nitride, and in 2014, Professor Nakamura and two more professors got the Nobel Prize on this. So, if we see the worldwide power consumption, around at 10 to 20% power consumption is only on the lightening, and by using these LEDs, we can save around 80 to 85% of the power. If we compared it with our ordinary bulb, the power consumption is very less, and the same light we will get by using the 8 or 10 watt LED, when an ordinary bulb will have to use the 100 watt. This one is because of the conversion; in light emitting diodes, conversion efficiency is very high compared to the ordinary bulb. Nerina: What are the challenges here? Mahesh: The biggest challenge is the awareness. If you compared with the conventional bulb, light-emitting diodes are a little bit expensive, because to make these devices, initially we have to spend a lot of money. We have to grow by molecular beam epitaxy, or MOCVD, and this equipment is costly; we have to set up a publication lab for gallium nitride technology. So, in this early cost of these devices, it’s hard, but if we see it in two years, we will get the same, this benefit by saving energy. So we have to aware the society to use light-emitting diodes in comparison to conventional bulbs. Nerina: How is the situation in India and how can your research contribute to improve it? Mahesh: One project I’m currently working on is the Perovskite solar cells. The basic idea is that we can make flexible solar cells, and with these solar cells the efficiency is higher than with the silicon cells. But again, the issue is how to make the long life, because this efficiency degraded very fast. Here, we have to make these solar cells sustainable, so we can use them for a longer time. We have increased our resources in this one. We have increased our production, but still, the power production is not sufficient for the country. If you see the solar light, we are getting the maximum. For example, in Pushkar, Rajasthan, Gujarat, we are getting the maximum solar light. And the rain or cloudy duration is very less. So here, we can use these solar cells, and we can convert maximum photo energy into electricity. Another thing is that in Rajasthan, we have minimum water resources, so we cannot generate the power by using the water, by using the hydropower. So, we can use these solar cells and we can convert the photoenergy into electricity, and basically we can make the system sustainable. Nerina: What does it mean for you to be a scientist in India? Mahesh: We have big responsibilities. As a scientist, not only I have to see the wide, wide problems, but I also have to see our local issues. For example, in the Rajasthan, the power transportation from one city, from one place to another place, is difficult here. So we have to see if you can use, if you can generate in local village or town energy by using the solar cells, and if you can make the village sustainable, and at least in energy, if we can provide the same energy watt hey will consume there, that will be good. Mahesh: Basically, I want a society in which everyone should get the same right. We should not differentiate based on the economy, based on any religion, so everyone, all kids should get the same facility here. If you see the worldwide view, we are all working for the human. We are the same. Our cultures are different, but sometimes we are facing multiple issues. I cannot go to that country, or I cannot invite from the neighboring country, or some other country. I would remove the borders, because all people are the same. I will not discriminate based on religion, based on geography, or based on any other practice. All humans are the same for me. Nerina: What types of research are more needed in India? Mahesh: In India we have much talent. We need some type of networking, some very good rue policy, and we need some interconnection between the scientists, and also between the government and the scientists. Nerina: And you are contributing to improve this through your work with the young academy, right? Mahesh: Yes. Indian National Young Academy of Scientists started in 2014, so you can say this is a very young academy. The main object of this academy is that we have to make more networking among Indian scientists. We have to discuss our local issues, and then we have to come up with solutions, because if we are pressing the problem, we should think, discuss, and try to give the solution to society. Another goal is to promote our science to society. We have to into the rural villages in remote areas, and we have to explain to the government people what we are doing. We have to conduct our next game, and we have to basically attract more students to our science. Nerina: What are the main points you are trying to contribute to? Mahesh: On the main issue, we are working on health, how to improve our health facilities. The second one is the energy; how to make a sustainable energy system. The third issue is education; how to provide high quality education to everyone. And fourth one is the food here. In few parts of our country we don’t have sufficient food; our government is working on this one and our academy as well. We have to aware our society to these issues. We have to implement these policies in all areas of our countries. Nerina: If you could change one thing, what would it be? Mahesh: If we focus on these issues, then we can work from a developing to a developed country. Basically, all these things will come from education, so one thing I want to change is our education system; every kid should get education. Second, I want to aware society of what is good and what is bad. For example, our government has stared so many campaigns; if we see, we have a big campaign in India, and all these kids are throwing whatever waste that they have in dust bins. Mahesh: I’m working on applied research. Basically my dream is that I want to make a few products, so that by using them, society can benefit, and I want to take my country from developing to developed country. In the coming ten, fifteen years, I want to see my country as a developed country. Mahesh: What is life about? I can say life is only relation. We have to make more friendships. We have to treat people equally, and listen to people, and try to solve their problems. This is life, and we have to learn from the mistakes. We should not think, always, I will get the success; sometimes failure is also important. We should learn from mistakes and failures and, again, we have to try. We should give our best to achieve something, and we should not worry so much about the result. Mahesh: Generally, I read the biography of scientists. And if you see, many great scientists came from very poor families, and then they contributed to society. Nerina: And what is your background? What is your story? Mahesh: I was born in a very small village, and I have struggled a lot for higher education, but thanks to our government there are many fellowships, and by getting those fellowships I came to this level. My father only passed until sixth grade, and my mother never went to school. And I did my double Master, and I did my PhD. My parents believed in me, and because of their grace, today I’m in this position. Nerina: What would you tell your parents, or what would you tell your children? Like a message for your parents or a message for your children, or for both. Mahesh: For my kids, I want to make them good human beings. And my parents, I want to thank them, they have believed in me. They don’t know what research I’m doing; they know I’m a professor, but they don’t know about my research. So, I would just like to thank them. They are not higher educated, but they believed in me, and they believe on my education. They gave me the highest education. Mahesh: Thank you so much. Nerina: And thank you for watching, thank you for listening, and thank you for sharing. Keep wondering, and see you soon again. Bye and ciao.